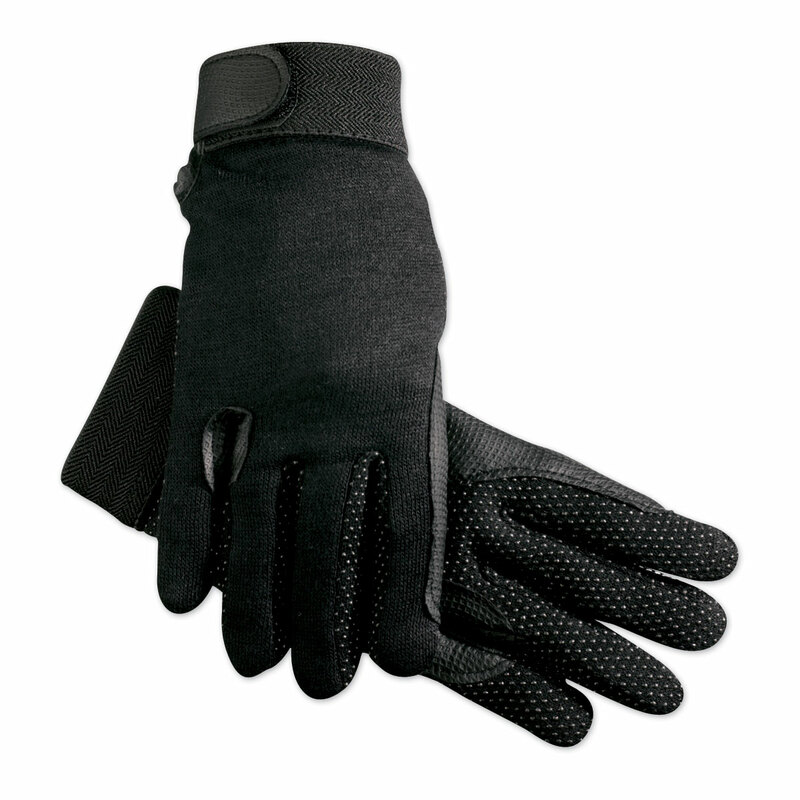 SSG Fleece Lined Winter Gripper glove is an economical, comfortable, warm knit cotton glove with pimple grip palm. Fleece lining for warmth. Reinforced in key areas. VELCRO® Brand wrist closure. Imported. SSG Fleece Lined Winter Gripper is rated 4.3 out of 5 by 155. Rated 4 out of 5 by Nancy from Nice and warm, good grip Good for late fall trail rides, nice fleece lining. A little bulky around the little finger. Good value for price! Rated 4 out of 5 by Rosie from Should be great for winter ahead. With cold weather just around the corner, I wanted a pair of gloves for doing chores with, maybe even riding in. These fit well and should do the trick. I haven't put them through the test yet which is why I pick good for the ratings instead of excellent. Rated 4 out of 5 by Farm3 from Great for chores. I use these during all the frigid cold snaps below 30. They are warm and durable. These are too loose for riding. Also, I prefer leather for riding. They run large. I usually wear a size 8. I had to cut the tips of the fingers off to get rid of the extra stuff. Rated 4 out of 5 by Rerider Suzanne from Warm, flexible nice palms fingers. I like there gloves because I cans hand wash them. They have grip and I can even use a liner. I wish they were a little longer in the wrist for cold weather. Great price. Rated 3 out of 5 by Horse friend from Washable Bought this for winter riding. These gloves would be better for fall riding when the weather is cold but not freezing. These gloves are a little tight in the fingers and while spreading my fingers...and I went up a size. They don't keep my hands as warm as I thought they would. However, they do not feel too bulky while gripping the reins. Rated 5 out of 5 by CGD101 from Keepa my hands super warm! These gloves are super soft on the inside. They keep my hands warm while I'm riding and doing different barn chores. I was worried they were going to be cheaply made, and not that warm because they are such an affordable price - but I was wrong! They're a great buy! Rated 1 out of 5 by Karri from Odd fit I had high hopes for these gloves based on the reviews, but they are not cut correctly. The thumb hole is huge (circumstance) and about 1/2 inch longer than my thumb. The rest of the fingers fit, so why the thumb is cut so oddly is beyond me. Full disclosure, I do have a normal sized thumbs, so I would think this would be a problem for many. Rated 5 out of 5 by Niteryder from Great Riding Gloves! These gloves are a must have for winter riding! Not only does the fleece lining keep my hands warm, but the pebbled grips help to get a better hold of the reins. Rated 3 out of 5 by J_d_n from Warm and cheap, but bulky fingers These were bought on a whim as schooling gloves, and they do a great job of keeping my hands warm during our mild winters. My main complaint is that the fingers run long, which makes buckling bridles and such a pain. This was easily fixed by sewing a new seam across the tops of the fingers and cutting off the excess material. They aren't the nicest, but I'm hard on gloves and didn't want to spend a small fortune on a new pair.